He is a mean little necromancer, even at green. He was able to cast spells that stuck even on a level 50 Ranger. He seemed to spawn after all the skeletons/mummies at the Totem were killed. He will follow the pathing of the other skeletons, which will have him move far away and return 1-3 minutes later, if not rooted first. With his pet, the best strategy is to DoT and nuke him as soon as possible and then deal with his pet, taking on both at the same time can be a quick death, if not prepared for the DoT onslaught he unleashes on the attacker. He will also use Fear and Cancel Magic. This page last modified 2008-01-02 15:04:44. I killed Larik Z'Vole today (Nov. 1, 2015) on the Ragefire progression server. It's too bad this website doesn't have like a way to upvote comments. I camped Larik for a day, killing all combination of mobs at the oblisk, no luck. I started reading all the comments here to see if maybe there's some other trick I could try. Burried deep in the comments someone mentioned actually using the Initiate neck piece around the oblisk, and what do you know that little ****** popped. 1. The bottom step mob on the oblisk spawns every 11 minutes. Before the mob spawns, use the neck piece WHILE standing on the Obelisk. 2. Larik should spawn on top of you and attack, try to be at full mana. 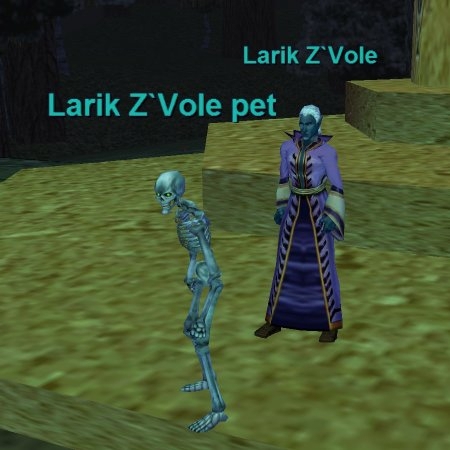 The nice thing about this is Larik won't have time to summon his Skel pet. Kill Larik. 3. After Larik dies turn to the SE and run. You're looking for the Dark Elf Camp along the southern edge of the zone. Don't go in the camp or they will kill you, instead position yourself in an open area on the NE side of the Dark Elf Camp. 4. The courier will be running (fast) towards you, target him and nuke that sucker before he gets to the Dark Elf camp. Hopefully you'll have enough mana to kill him. Suggestions, use the Advanced Looter so you don't have to loot Larik right away, you can do it once you get the courier. SoW is helpful to catch the courier, but I did it without SoW, and encombered, just move as fast as possible. Lastly, if the courier makes it to the camp of Dark Elves, you won't be able to kill him, don't try it unless you have a group of 50s camping the dark elves. Good news though Larik should spawn again in a short while, now that you know the trigger. I am a Druid of Tunare on the Prexus server. I've been Multi-Questing the Warden Symbol of Tunare for fellow Druids for a long time now. Here are the methods I use each time. I start by BINDING myself at the Gfay entrance...right where the dirt path begins. This is very important later!! I head to the Obelisk and see what spawns are UP at the moment. There are 4 KEY spawns you will need to adjust at the Obelisk. Your goal is to have ONLY skeletons UP. The place-holder for the Dark Elf is the mob on the BOTTOM STEP only. If you see anything other than a skeleton at these spawn points - kill it. When a skeleton DOES spawn - leave it. By killing the mob on the bottom step early in the evening - The Dark Elf will spawn later in the night. Immediately after looting the Dark Elf - You must GATE back to your bind point as fast as possible. Once you reappear - the courier will now be on your track-list. Quickly hunt him down before he de-spawns! By gating and then tracking - you buy yourself enough time to reach him! I got there early in the day so i just killed place holders till I got the 4x skels up. Then mainly from being bored killed the skel at around 11am on the bottom step, it then spawned another skel around 5pm game time. I then waited till 7pm and killed it again, just after 12 midnight to 1am the necro spawned, easy druid kill at lvl 27. I killed the Necro twice now but was unable to get the courier as someone killed it before I could get to him. Spawn time for the PH's Undead at Obelisk (Totem) is 5 mins and I don't know how often the Necro spawns but I have sat for about 6 hours trying to get him to respawn again. This quest is ridiculous. I sat for 4-6 hrs waiting for this DE to spawn. Nothing. Killed the mob on the obelisk. Did everything and tried everything. The spawn rate is unreal. If there is one. Wait, you mean he actually spawns??? Well, after sitting around for awhile staring at my computer screen and reading a book I got sick of this freaking horrible spawn rate. I could almost swear he's not meant to pop. Anyone know a surefire way to get this SOB to appear so I can get over with this stupid quest already. Tried since lvl 20 and still no luck...camped for about 5 hours then and a couple more hours some lvls later and still no luck =( thank you VI for one of the most annoying spawns for a dumb low level quest. I'M GOING INSANE!!!!! I'm 2 ticks of blue away from 71 (when the new expansion comes out) ... and I *still* don't have this quest completed. The spawn rate is INSANE for all of the mobs, *especially* the courier. RE: Wait, you mean he actually spawns??? This guy spawns more then the Gnoll Hunters or Gnoll Brewers. I tried every way to get him to spawn, short of sacrificing a dark elf at midnight. I think I spent a week of 3-8 hours a day waiting for him. He seemed more random then on a set time. tried most of the suggestions offered by others below, w/out success, and impatient after too many RL hours, i stood on his spawn spot and spam clicked the Initate neck awarded from the prior step. Larik pop'd on the next cycle. confirmed this wasnt luck on my second time thru the quest when the same procedure caused him to pop in about 20 min. just keep the obelisk clear till he spawns and be ready to dash NorthEast to intercept the courier. seems USING the Initiate Symbol is a trigger. I showed up in Lfay working on the first and second Tunare quests. The Dark Elf Courier was up in the Tier Dal camp. An easy kill for a 31st level Druid with Harmony. I camped the necro for 5 more EQ days with no sign of his spawn. Luckily I killed enough ghasts to finish the first quest. I returned to Felwithe and turned in ghast hearts and initiated the second quest by telling Bronzeleaf "I will slay the necromancer". I returned to Lfay and camped the obelisk for one more EQ day. I arrived at 12pm and killed the placeholder skeleton on the first step. At 7PM the placeholder popped again, but this time was a Mummy instead of the typical skeleton. Around 12AM that EQ day(and exactly 15 minutes after the Mummy was slain) Larik spawned. He and his pet were easily kills, its Equestrielle and the Brownie scouts that you must be careful of. Theory: The spawn of Larik is triggered by the second quest initiation in Felewithe, and the last place holder before Larik is a Mummy instead of a skeleton. I had been camping these spires for 5 eq days and getting REALLY bored. I read this and went back, killed the skelly on the bottom step at 1pm, at 6pm a mummy spawned on the bottom step and i killed it. At exactly 11pm Larik spawned and was no problem. i was bound on the path from steamfont by the gnome encampment, so gated there after looting larik. Popped up track there was the courier. He was running down the path from Gfay so i ran to intercept him. 1 snare, 1 root and a couple of dds and he was down. Riddle : What question is its own answer? <What> works the first time? This timed thing is crap. I have had my druid camping this for 3 real days. I have tried every sequence of times listed. I had some newbies give bone chips in during mentioed times. I have kept the camp clear, I have opened only that bottom step, nothing works. 1. Tried the 7p.m. trick twice did not work for me. 2. Waited till 4 a.m. and with all others up, I killed the skelly on bottom step and Larik spawned twice,different days. Killed the necro twice last night - he spawned back to back almost - like 15 minutes apart. Both times I gated to MM entrance ran to tier dal camp and waited tracking for the courier never saw the courier. Not once. Interesting thing about the second time Larrik spawned I had to run from the tier dal camp back to him to kill him. When i got there he was being attacked by one of those little red demon things that are flying around since the cazic thule thing. I'm wondering if the courier is getting killed by them as well. Here is the most up-to-date and accurate information I have. I am level 35, cleric, on Rodcet Nife. I have been in Lesser Fay this entire past long weekend... anyway, on to the info. All weekend, I only had the necro spawn twice. The placeholder for him spawns on the lower step of the undead obelisk(approx. 0, pos 2200) and takes about 15 minutes, real life time, to respawn... this means that the in-game time goes forward about 4-5 hours between the spawns. I found that killing the placeholder(usually a skeleton) at around 8pm game time would have another pop around midnight, and that was usually the necro. When the pop was at different times, say, 2am, it was always a skeleton. Luck? Chance? Maybe, not sure. Also, only once during the weekend I had the Ghoul Boss spawn. He was NOT on the upper step of the obelisk, he was on the hill right in front of the obelisk. High blue to me, 35 cleric. Fear kited him and had no problems. The second time I killed the necro, I immediately ran to the Tier`Dal camp and waited on the hill just to the east of the camp. I was standing at approximate loc of neg 780, pos 980, facing east. After about 30 seconds, the courier came running straight towards me, from the east. Rooted, and blasted twice for 265 each. He was still alive after that so I had to melee him for a few hits before he went down. The ghasts are the longest part of the whole quests. I've killed about 13 and have only 2 hearts. What I usually do is camp for the necro, and kill the surrounding static undead. After the four static undead around the obelisk are dead, I cast Sense Dead. For the next 15 minutes or so, I hunt the sensed dead and eventually will get one or two ghasts per hour or so. They seem to spawn at different times, but mostly during the night. You will find an odd one at 5pm or so sometimes. The Warden part of the quest has great information posted already, so no need for me to say anything about that part. Courier spawns at GF zone NOT Steamfint Zone. Trust me I spent a few days camping necro and Courier. I killed necro and ran following my track and found him up near the GF zone. Anybody know what quest his heads for? It is part of the quest that comes up after you turn in the 4 Ghast hearts. You need his head, the head of a courier and a crate he carries. Turn those in with your Initiate Symbol of Tunare and you receive something else.